I’ve been writing a paper on Alexander the Great over the past two years. 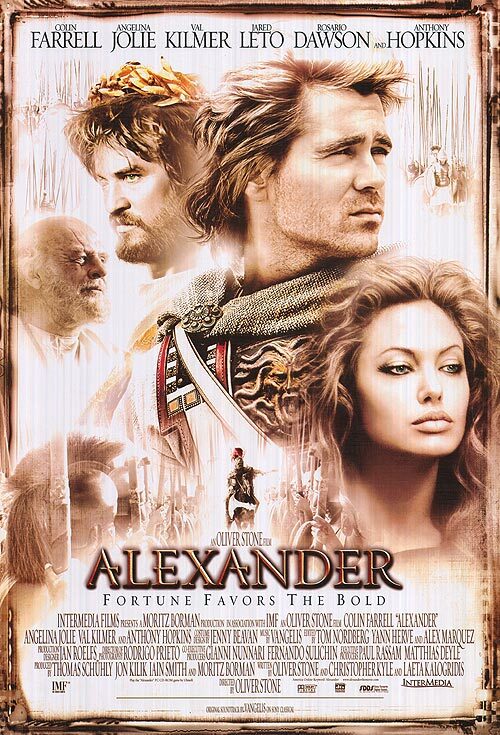 The paper compares the ancient sources on Alexander’s life with modern media such as the movie above. For those of you who aren’t familiar with Alexander, he was a Macedonian King that conquered most of the world known to western and near eastern civilizations at that time. Macedonia is one of the hilly nations north of Greece. The Macedonians had a culture similar to that of Greece. I’d rather not get too deep into the debate about whether Macedonians are ethnically Greeks or not. The debate actually decides some of the territory lines between Macedonia and Greece. I think its safe to say that the ancient Greeks thought of Macedonians as uncivilized rude Greeks. A bit like how Democrats see Republicans and vice versa. Macedonians were famous for drinking a lot more than the Greeks. Alexander the Great shared this alcoholic problem. The ancient histories about him contain many episodes in which he gets outrageously drunk. He even kills one of his best friends during one of his binges. There’s also a lot of speculation about whether Alexander was a homosexual or not. This speculation is sparked by Alexander’s close friendship with another man named Hephaestion. The relationship was likely not sexual. Greeks did condone male-to-male sexual relationships, but only if they were pedophilic. The older man was seen as teaching the younger one. When the younger became an adult, the loving relationship transitioned into a lifelong friendship. Alexander was almost certainly not in such a relationship with Hephaestion. The ancient Greeks do not use the words for such a relationship when describing the two. Alexander and Hephaestion were also the same age, making the pedophilic aspect of such relationships impossible. Alexander did have homosexual relationships with other men. Additionally, he was married to three women. This sort of pansexuality was typical of a Macedonian king of the time. The first statement is the correct one. Alexander was not gay. Its not even clear if he was pansexual. He may have been heterosexual, but pressured into homosexual relationships because they were expected of someone in his position. The homosexual relationships he took part in were not with Hephaestion, they were with pre-teen boys. Using this point in an argument is kind of like shooting yourself in the foot. The Greeks may have had homosexual relationships, but they were pedophilic in nature and they were certainly not marriages. Just a little nerdy historian bit from me. That’s all for this week! Here’s the first chapter of the Hornblower story I’m writing. The name of the story is The True Colors. The first Hornblower book was called Flying Colours so the title is a callback to that. Here it is! The carriage rocked along the dirt road to Gillingham as Hornblower considered the letter he’d received a week before. The contents of the letter had been hard for him to believe, even if he had hoped for such a message over the last ten years. Bush was alive! Hornblower hadn’t considered it possible. He’d ordered many searches of the Seine River after the powder explosion presumably killed his best friend. He had even searched it himself after Allied Powers exiled the dictator to Elba and France was safe for decent Englishmen to travel in once more. He’d found no trace of Captain Bush, not even a splinter from his wooden leg. It has been ten years since our last meeting. I am sorry that I could not see you or correspond with you in the meantime, but other matters of the utmost importance held my attention. I feared that the slightest contact with those I cared about might endanger them or their loved ones. I apologize and beg your forgiveness for my long abstinence from our friendship. Hopefully you will see in time that my choice was the right one. I fear I have need of your help Hornblower, now more than ever. On the evening of the 21st of September I will be at the Pickled Keg on the eastern end of the Gillingham Docks just three doors down from the Tower and Keep where you once played whist to supplement your lieutenant’s half-pay. I hope that you can meet me there. There is much we must discuss of personal matters and those more grave that have occupied me this last decade. I hope that you will come, my old friend. It shall not be the same without you. 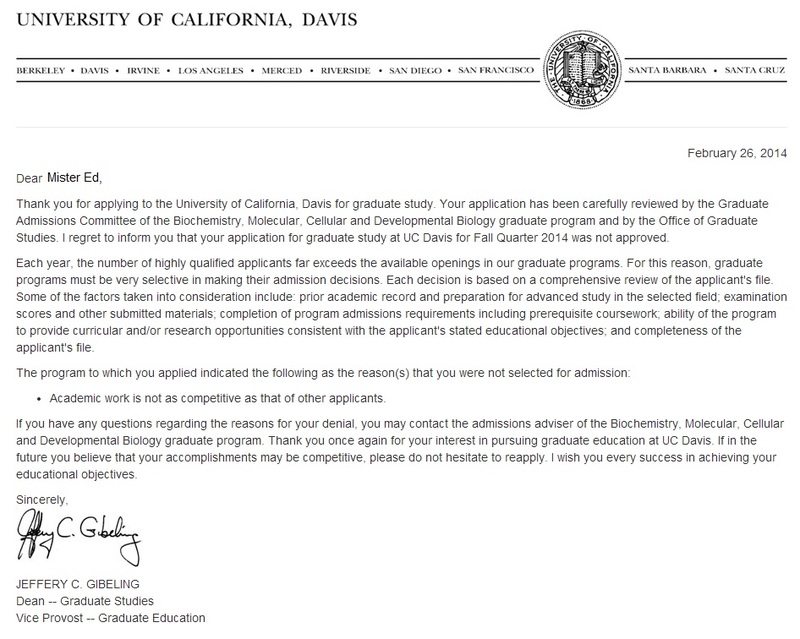 The end of the letter bore a seal unfamiliar to Hornblower. A red shield with a chevron bore a cross pattée in the upper left, a crown in the upper right, and three upward pointing swords upon the bottom. Atop the shield rested a helm with a griffon rising out of the helm itself. Surrounding the shield and helm were the typical vines of nobility that Hornblower never truly understood the appeal of. At first, Hornblower had been unsure of the authenticity of the letter. He’d been so certain of Bush’s death. He’d attended the funeral. He’d sought out Bush’s family in the hopes of honoring one of his sons or brothers with knighthood in the Order of Bath. Hornblower had previously avoided meeting Bush’s family for fear that entanglement with them might interfere with his duties as a naval officer. Hornblower had offered Bush’s mother and sisters his condolences along with ensuring that half of Bush’s pay would continue to be collected by them for their support. He was, however, unsuccessful in finding any male relatives of his friend. Regardless, for the last ten years Hornblower had been utterly convinced of Bush’s death. And now a letter arrived claiming that Captain William Bush was still alive. Hornblower could scarcely believe it. He had lied to his wife Barbara, saying that he was going to meet the German Prince Paul from his voyages aboard the HMS Atropos, visiting from Paris. When she asked why Prince Paul was not calling at the estate, Hornblower had stuttered and said it was a business matter not a social call. Barbara had graciously left it at that, but he knew he’d have to tell her the truth upon his return. He only hoped there would be more to tell then. The wobbling of the carriage wheels made him sick as it bounced over the cobblestone road into Gillingham. They slowly pulled through the town as dusk fell. Flames flickered in the streetlights and Hornblower could smell the ocean breeze. If he cocked his ear just right he could hear the waves washing against the wood of the ships at port. He hadn’t realized how much he missed that sound. The driver pulled up to the middle of the port as instructed. Hornblower felt the carriage creak as the driver got down from his seat and moved to open the door. Hornblower stiffly pulled on his gloves. The driver opened the door and as he did so, Hornblower had a thought to leave Bush’s letter behind in case this meeting was not with Bush. It was more likely a ruse and Lady Barbara should know where he had gone if he did not return due to any foul play. He cursed and pulled off his right glove to retrieve the letter from his inside coat pocket. While looking at the step down from the carriage Hornblower spoke to the driver, “Wait for me until tomorrow at this spot. If I should not return, give this letter to Lady Barbara.” He indicated the letter as he set it down on the cabin seat. Hornblower donned his right glove once more and shivered in the cold. He hadn’t missed this part of the sea. He shoved his hands into his outer coat pockets as he walked away from the sun to the eastern side of the docks. What would Hornblower find at the Pickled Keg? Was it really Bush who had sent the letter? If it wasn’t, why would someone concoct such a ridiculous lie? Why had he believed it? Were they trying to kidnap him to blackmail Lady Barbara? If that was true, then Hornblower was quite glad he had brought his pistol on a holster inside his coat. But what if it was Bush who had sent the letter? How had he survived the explosion? If he had survived, why hadn’t he been found afterwards? Why had he waited ten years before contacting Hornblower or anyone else? Had he spoken to his bereaved family? What were the grave matters that had occupied him in the mean time? Hornblower sighed and resigned himself to finding out within the next few minutes. He walked on past the docks, past the Tower and Keep, and up to the front of the Pickled Keg. He pushed in the door and walked inside. The room inside was decently sized for a tavern. Several long tables lined the middle of the room with a bar at the far end from the door. Booths were on the right side of the room and a roaring fire on the left side. A good crop of people were eating the daily soup, playing cards, and drinking a sour smelling liquid with a smell that permeated the air. Peanut shells crunched under his feet as Hornblower entered the room looking for his old friend. There! At the last booth furthest from the door he saw a wooden leg poking out from the seat. That must be Bush. Hornblower slowly walked over, still cautious. He felt inside his coat and was reassured by the feel of his pistol. He turned the corner around the tables and felt beads of sweat appear on his forehead and under his armpits. He hadn’t realized how hot it was in here, even opposite the fireplace. He approached the booth at the end and looked down. Hornblower looked at his face and the offered hand. Should he hug him instead? Should he just take his hand or refuse it? After all, Bush had refused to contact him for over ten years! He decided the middle road was best and took Bush’s hand. He gave it a firm grip while Bush moved his hand up and down. Hornblower felt Bush letting go and quickly placed his left hand to lengthen the long forgotten contact with his old friend. If he let go, would this ghost disappear? When I was a kid my dad and I traveled around in the car together a lot. We’d go to soccer practice or he’d drop me off at a friend’s house. My family was lucky enough to own a second house about two hours away from our first home. My dad and I would go to the second home on weekends with our dogs and hang out. On the drive to the second home we’d listen to books on tape in the car. The topics varied a bit. We’d listen to recordings of live storytellers, Greek classical history, mystery novels and a few other things. Our favorite thing to listen to was the Hornblower series by CS Forester. The Hornblower series is set of adventure novels about a British naval officer named Hornblower who served during the Napoleonic wars. Hornblower’s fictional life is loosely based off of Lord Trafalgar, an English naval hero of the Napoleonic wars. Hornblower starts off as only a midshipman, but by the end of the series he is a Lord with title and governance over a variety of places. The Hornblower books are told from a limited third person point of view. The focal character is often not Hornblower, but Lieutenant Bush. Bush is initially Hornblower’s superior officer, but as Hornblower progresses through the ranks he eventually surpasses Bush. Hornblower and Bush become best friends during the series and chance places them together or they always request joint assignments. In one of the latter Hornblower books, Bush goes off an a separate mission and supposedly dies. My dad and I thought for sure he was only thought to be dead, but as the book progressed it became clear that Bush was gone for good. He never reappeared in the subsequent books either. As a present for my dad I’ve started writing a few Hornblower chapters for my own book. In my book, Bush survives the explosion that killed him, but went into hiding. He comes out of hiding for Hornblower’s help in a new endeavour. Since it’s in vogue right now, I decided the new endeavour would be that Napoleon has risen from the dead as a vampire. Bush and Hornblower will team up to take him down! I’ll most likely be posting a few of the chapters here as they are finished. 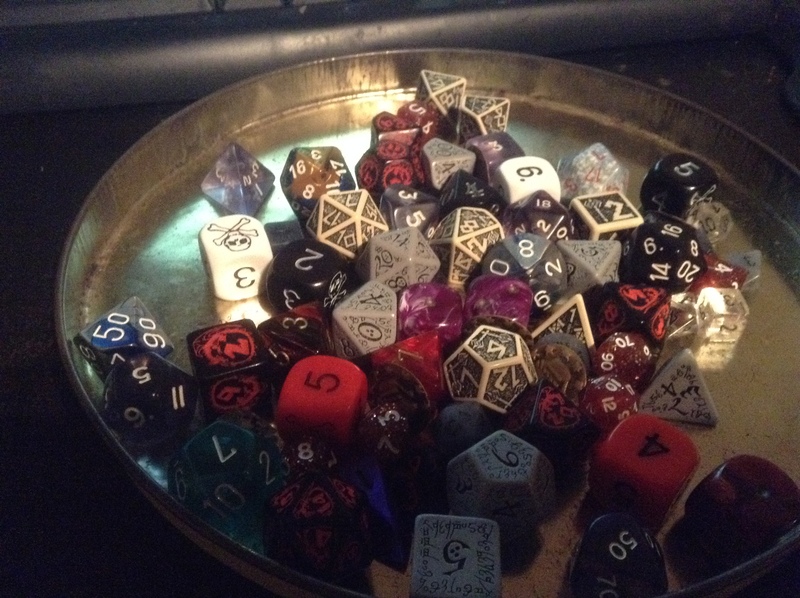 These are my personal dice that I use when I play D&D. The imagination aspects of D&D set it apart from most other games, but the dice do that as well. D&D uses dice all the time to decide what happens in the game. Dice are rolled when you talk to other characters, when you try to hit something with a sword, and when you try to figure out what a magic potion does. D&D has many different types of dice, all of which you can see here. And in case you were wondering dice is the plural. The singular of the noun is die. The seven types are 4-sided dice, 6-sided dice, 8-sided dice, 10-sided dice, 12-sided dice, and 20-sided dice. In D&D these are abbreviated to just d4, d6, d8, d10, d12, and d20. When you roll a certain number of dice there’s an additional abbreviation. If you roll two 6-sided dice then you are rolling 2d6. If you’re rolling two 8-sided dice and adding 5 then you are rolling 2d8+5. Owning and rolling the dice becomes fun for its own sake the more you play the game. The dice in the picture are just all my personal sets in a pile. I have loads more that I loan out to other people when I play with them. I keep those dice in a wooden box that looks like a d6. When you roll the dice in D&D you’re always trying to get high numbers. The most often rolled die is the d20. The d20 is used for all of the activities I listed above and many more. It’s used when you swim, when you climb, and when you listen at a door to see what’s behind it. When you roll a 20 on a d20, you celebrate! You rolled a natural 20 or a critical hit (often abbreviated as a crit). A crit lets your character perform whatever task he was attempting to the best of his ability. If he was debating someone, he utterly defeats them. If he was swimming, he sets a new personal record. If he was making a cake, he bakes an amazing cake that everyone loves to eat. Similarly, if you roll a 1 on a d20, it’s called a fumble. When you fumble, something bad happens. The most common result is that your shoelace comes untied and you trip on it. The dice are used to resolve all but the simplest actions in the game. It’s fun for me to trudge into a dragon’s lair and not know exactly whether my character will come out alive or not. I hope he does, but victory is never assured. In our last session the dragon toasted and burned two of us! This comic from Saturday Morning Breakfast Cereal jives with my opinion of American news networks as I mentioned in my previous post. American news networks seem to universally never cover anything newsworthy. They cover election news and stuff in politics when relevant, but the rest of it is just buzz. The news networks are often set up where they service an area of about 5 million people or more. Within that area they could pick a story about how one person is over a hundred or how a single school out of the hundreds needs books. The news never covers something like a school district wide book shortage by having in depth interviews with the librarians from that district. Another example from my local news. They’ve jumped all over a recent murder case. Some of the headlines are “Crime On The Rise” or “What Can You Do To Protect Yourself?” The murder was committed by a self-confessed psychopath. There is no crime on the rise in this situation, its just an individual. There sadly isn’t really a way to protect yourself from crazy people either. What I noticed from these headlines was that the local news is capitalizing on the fear the headlines and story creates to push more of their newspapers/page views. I do get a little conflicted at times on the issue though. I never feel like reading or watching American news its almost all fear, puff pieces, or politic information I can get faster from the internet. But when I do watch it I occasionally see why they reported on that topic. With the psychopath murderer, how could you not report on that as a local news agency? It’d be foolish not to as it sells papers and it’d be dishonest to the public. We deserve to know that someone like that was in the neighborhood. Really? I can see the value of the story, but is it front page material? I don’t think so. Just some of my rambling thoughts. I get most of my news from things my friends post on Facebook. When I look for news on my own, my source is the BBC. I’ve found that American news is… lacking. For example, when the BBC was covering the riots in Thailand and Ukraine, CNN was covering Taco Bell’s introduction of Mountain Dew to their soda fountain. 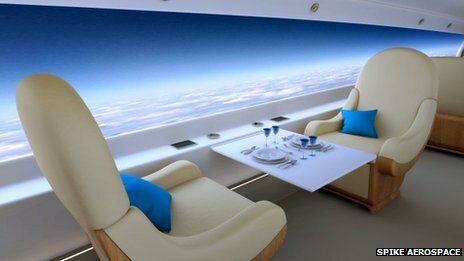 A fancy jet company is talking about introducing a supersonic jet for transatlantic flights. It’d be capable of making the journey in under 4 hours. The best part? The entire length of the walls inside are TV screens showing projections of the outside of the plane. The engineers of the plane explained it as “reducing drag from windows” or some nonsense like that, but we all know why they did this. It looks freaking amazing. I would love to take a ride in this plane. Unfortunately, the company plans a passenger capacity of only 18 people. The flights would probably be ridiculously expensive. Still, maybe I can put it on my bucket list with all the other things I will feel bad for doing when I am old and should be donating my money.